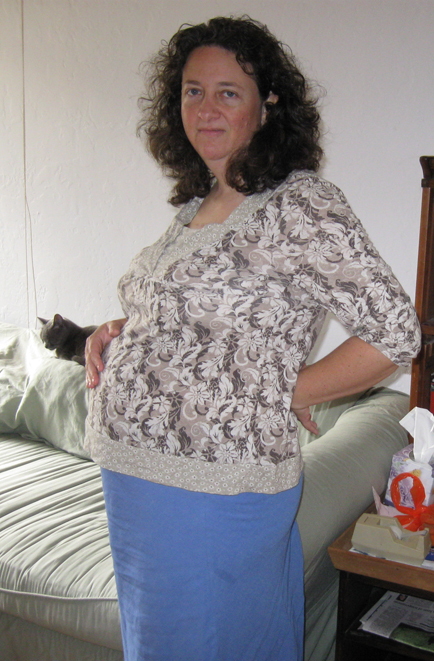 Here I am at 19 weeks, 4 1/2 months and well into my 2nd trimester. I keep asking Michael “do I look pregnant in this? (as opposed to just fat) and, well, judge for yourself. Things are going pretty well. At 17 weeks I saw my wonderful family doctor for the last time (she’s switching to another practice, far away and doesn’t take my insurance). I told her I was taking her up on her ultrasound offer. I couldn’t stand it anymore, tell me how many babies are inside me! Hooray! the answer is one. One baby and one humongous placenta (which she said could very well account for why my uterus measures 3-4 weeks bigger than it should. This was a low-level ultrasound with a dinky little screen so forget about finding out gender or anything else, aside from seeing that the heart was beating and the placenta was not over the cervix (very good). We also saw little arms and legs kicking away. We’ll have the full hospital clinic ultrasound next month. I had mixed feelings about the idea of twins. This is almost certainly my last pregnancy and so it’s my only chance to have 3 children. But, really, all I felt was relief when I found out there was just one. Much easier pregnancy and birth and not as difficult to take care of one baby as it is two. Michael was freaking at the very idea of twins, so to say he’s relieved is an understatement. Miriam says she would have loved twins (like some close friends of hers) but she wanted a boy and a girl. I still get tired a lot but don’t have many full-out fatigue episodes. I’m not able to exercise regularly again yet but I can do some. I’ve been getting some edema (water retention) in my lower legs but my blood pressure is totally normal. I had a lot of edema (and normal BP) with Miriam too. I’ve gained 5 lbs so far. Below is Miriam’s favorite position, especially in the morning. She comes and finds me on the computer, nurses in my lap, then insists on being carried to the couch. Though between my growing belly and her growing body, I can’t really carry her much anymore. And nursing is hurting more and more, especially after I shower, so I don’t do much beyond her morning snuggle time. She says I still have milk though (that will likely change).